I think John was cleaning out his wallet (was it in 1960, 1965, or just the other day???) when he found pix of these darling damsels. 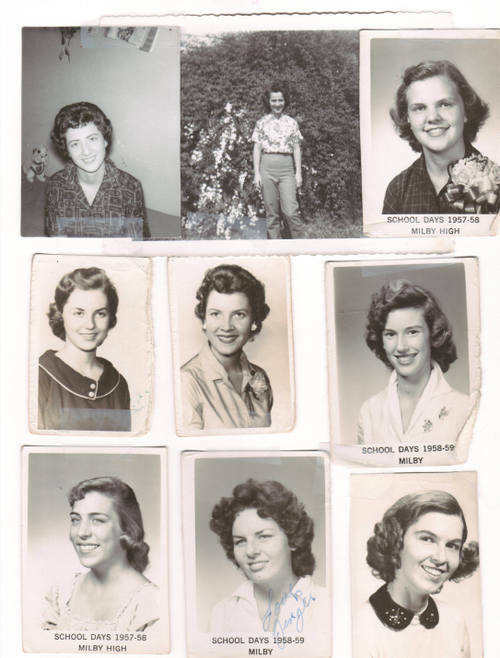 Left to right, top to bottom: Sylvia Crawford, Billie Jean Trombatore, Sammie Farquhar, Miriam Monical, Sue Sanford, Arline Baumgarth, Roxanne Cox, Virginia Mancuso, Ann Garland. I don't know exactly what a trio of these gals had in mind when they wrote on the backs of their photos: "To a boy who shares my chemistry", "Hey, Moose", and "To a very persistent guy!" Clarification, John??? Girls?? ?